Looking for the best automatic dive watch under 200 bucks? When you’re looking for an automatic dive watch in this price range, there are three companies that consistently pop up: Seiko, Citizen and Orient. They have a real corner on the basic automatic watch market, and for good reason. They are all able to produce quality movements that will take a beating, and they’re able to do it inexpensively enough that those savings get passed along to the customer. Each company produces their own movements and they all have a nice lineup of attractive designs. Seiko in particular has dozens of options in this price range, as well as an active aftermarket modding community. With that said, what is the best watch for the money? This is somewhat subjective, but I will do my best to break it down below. The watches we’re going to compare are the Seiko SKX007 and SKX009, The Orient Ray and Mako, the Seiko Monster and the Citizen Promaster Diver. The SKX line was designed to be a professional diver’s watch. The SKX007 sticks to a traditional black while the SKX009 is a little flashier with its dual color bezel. All of the design decisions on this watch were made with utility in mind, and as such it gives off a strong tool watch vibe. This is evident everywhere you look, from the knurling around the bezel to the flat, uncluttered dial design. Seiko really embraced the function-over-form philosophy with this watch, but still managed to keep it quite attractive. It employs a screw-down crown and screw-down case back with an ISO rating of 200 meters water resistance. The bracelet is a jubilee design with solid outer links and folded center links. This makes the bracelet somewhat lightweight and flimsy feeling. Some people might find the lighter weight and flexibility desirable, but for me it throws the balance of the watch off. That said, the bracelet is the easiest thing on a watch to replace, and Seiko offers an Oyster Bracelet that is exceptional. All of this comes together to make for an attractive tough-as-nails watch, both above water and below. You can find both the SKX007 and the SKX009 on Amazon for just under 200 bucks. The Orient Ray and Mako are essentially identical save for the differing dials and hands. They both use the same case, which is nicely proportioned and feels solid. 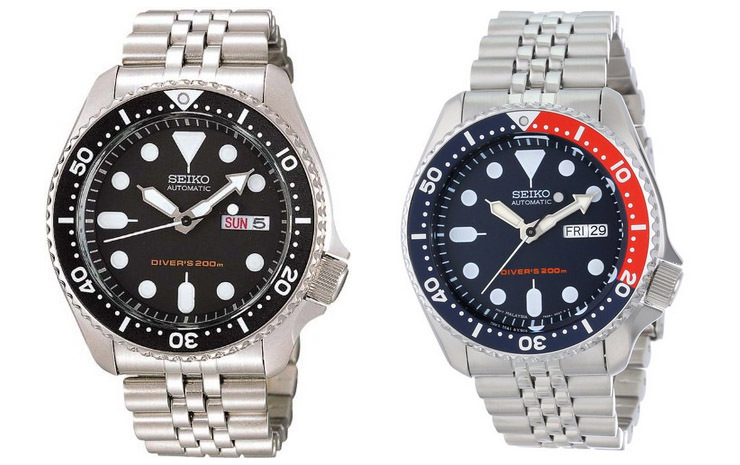 Where the Seiko SKX007 leans more towards a tool aesthetic, the Ray and Mako lean the other way entirely, incorporating more formal elements in their design. Where the SKX007 has a knurled bezel with sharp transitions, the Ray and Mako employ a smoothly angled bezel with shallow indents. This makes it more difficult to rotate, but damn does it look nice. The Ray and Mako both list a water resistance of 200 meters. However, they are not ISO certified, so keep that in mind before taking them down to the seafloor. With a more refined look, these two might be more suited to the casual weekender than the serious divers out there. 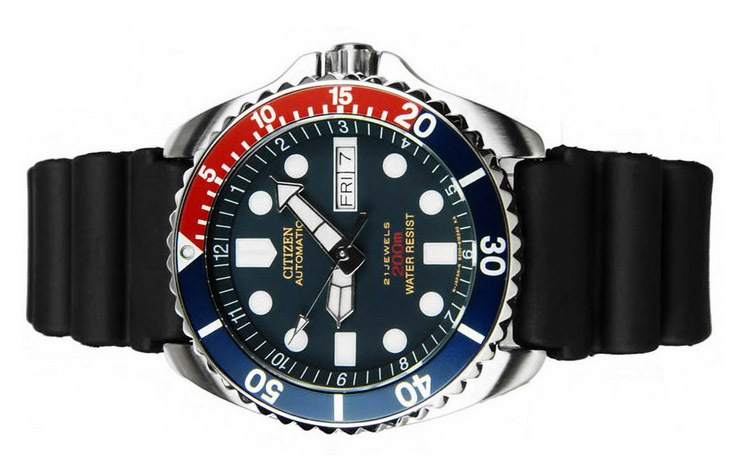 If you are looking for a dive watch that keeps the tool vibe on the down low and lets its inner tuxedo out, this might be the watch for you. The Ray really has a classy feel with its glossy black bezel and chrome outlined indices. 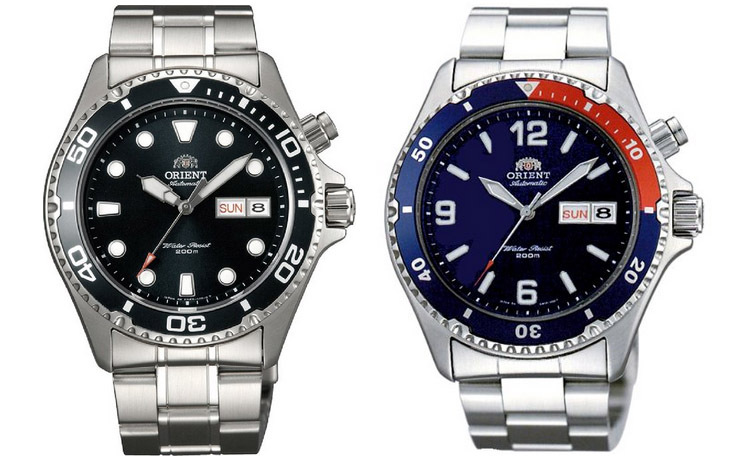 Both the Ray and the Mako can be found on Orient’s website for around $300.00, however if you use the Coupon Code “Memorial50″ you can get 50% off your entire order as well as free shipping. This brings each watch down to about $150.00. Not bad! The Seiko monster, as its name may suggest, is a rather bold watch. People tend to either love it or hate it, and I have to admit at first I didn’t like it at all. Given a casual glance I thought the Monster was, well, kind of ugly. The first details I noticed were the clunky indices and gigantic bezel, and it was kind of a shock. Why is this watch so popular? I don’t get it! It wasn’t until I actually got my hands on one that it started to dawn on me. The construction on this watch is outstanding. All of the design elements that seem so strange at first begin to make sense upon closer inspection. The shroud, the dial and hands, the enormous bezel, it all somehow fits together, making what I thought was an asymmetrical mess seem measured and balanced. This is a watch that takes some getting used to and you really have to hold it in your hands to appreciate the strange beauty of this hulking monster. There is no denying that this watch has serious wrist presence, and you need to keep that in mind when wearing it. Is it a great weekend watch? Absolutely. Good for a board meeting? Maybe not. 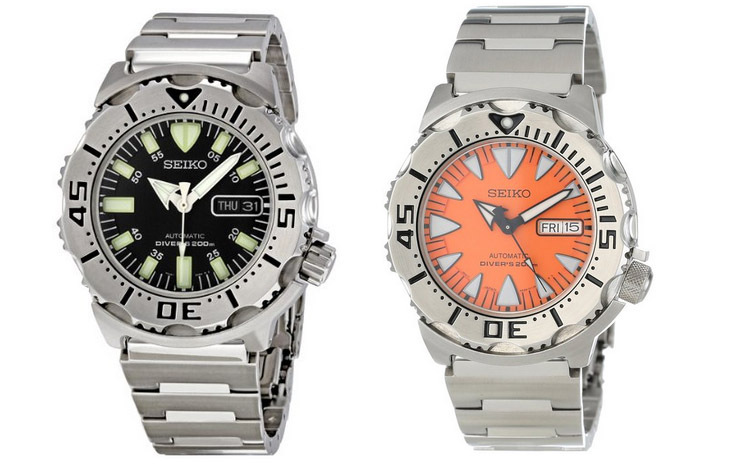 The Seiko Black Monster and Orange Monster can be found on Amazon for 184.00 each. Citizen is a Japanese watch manufacturer that has been around since the early 1900′s. Like Seiko, they manufacture a large array of timepieces that fit within many price brackets. Much of their development over the last 15 or so years has been focused on their Eco Drive watches, which are great in their own right, but today we will be focusing on one of their automatics, the Promaster Diver. The first thing you’ll notice about the Promaster Diver is Citizen’s take on the classic Pepsi dial. It is nicely proportioned and the numerals are crisp and well defined. The next aspect that catches the eye is the obliquely slanted chapter ring. This element along with the gently sloping case give it a pillowy look that seems somewhat soft for a tool watch, but somehow still works well. The Promaster Diver uses Citizen’s Miyota movement which is every bit as durable and reliable as the Seiko 7s26 movements, and has the added benefit of being hand windable. The hand winding option is nice, but it comes at the cost of only being wound by the rotor in one direction, so you might need to hand wind it from time to time, though that is only speculation on my part. With a case diameter of 41mm including the crown, the Promaster Diver is the smallest watch in our lineup, which may or may not be desirable depending on your wrist. Another item of note is that Citizen stopped making bracelets for this particular watch, so with the Promaster Diver, it’s rubber strap or nothing. The Citizen Promaster Diver is getting harder to find online, but you can still pick one up at Citizen Watches Online for about 155.00. So now that we’ve seen all the watches side by side, which is the best? Well, unfortunately that’s not something I can decide unequivocally. Each watch has its strengths and weaknesses, and none are so glaringly obvious that one could be called objectively better than the other. It all comes down to personal preference at this point, and you really can’t go wrong with any of them. Each of these watches is a bargain at under 200 bucks and you’ll get a lot of watch for the money no matter which you pick.